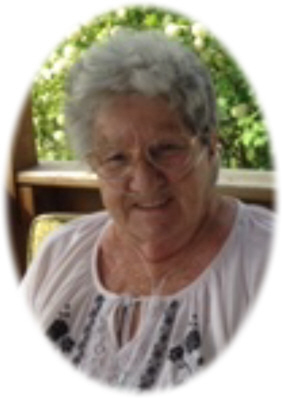 Bonnie Lou (Harvey) Rulapaugh age 80, of Sumner, MI, passed away surrounded by her loving family Friday, April 5, 2019, at the Woodland Hospice House, Mt. Pleasant, MI. Funeral Services will be held at Smith Family Funeral Homes Ithaca, MI, on Wednesday, April 10, 2019 at 10:00 A.M., with Pastor John Hagerman and Pastor George Showers officiating. Interment will be at Memorial Gardens of Mt. Pleasant. Visitation will be held on Tuesday, April 9, 2019 from 2-8 P.M. with family present from 2-4 & 6-8 P.M. at the funeral home. Bonnie was born in Mt. Pleasant, MI on February 16, 1939, the daughter of George W. and Mary L. (VanOrden) Harvey. She attended Mt. Pleasant Public Schools. On June 17, 1967, Bonnie married Oscar Rulapaugh at the Coe Church of Christ in St. Louis, MI. Together they shared 52 years of marriage. Bonnie and Oscar have been members of the New Haven Church of God for nearly 40 years. Bonnie's husband, children and grandchildren were the love of her life. The Scale House at Hubscher & Son Gravel Pit provided a great opportunity for her to raise her children and grandchildren for over 40 years. Bonnie took pride in knowing all of her customers by name and enjoyed conversations with each one. She loved reading, crocheting, and bird watching in her spare time. Bonnie is survived by her husband Oscar, and 7 children: Becky Hoeft of Traverse City, Markeith Hardison of AL, John (Tammy) Cashen of Alma, Tim (Don Nickbarg) Cashen of CA, Balinda Rulapaugh of NC, Oscar "OJ" (Terri) Rulapaugh Jr. of Sumner, and Teresa (Neil) Siefker of Alma. She is also survived by 18 grandchildren, 19 great grandchildren, and many nieces and nephews. Bonnie was preceded in death by her parents, 4 brothers: Roy, Jim, Bill and Jerry Harvey; and a sister Lucille Leiferman. Memorials may be made to Gratiot County Commission on Aging, 515 S. Pine River St., Ithaca, MI 48847. Online condolences may be made at www.smithfamilyfuneralhomes.com. The family is being served by Smith Family Funeral Homes, Ithaca, MI.